The Mission Driven Hospital has already been wholeheartedly endorsed by the health care leadership community in North America including the influential Ontario Hospital Association. The book shows hospital CEOs and Boards how to turn their mission statement from murk into a masterpiece; how to avoid the many mission mistakes that most hospitals seem to make over and over again; and how to capture the elusive mission mystique that separates high performing hospitals from the also-rans. 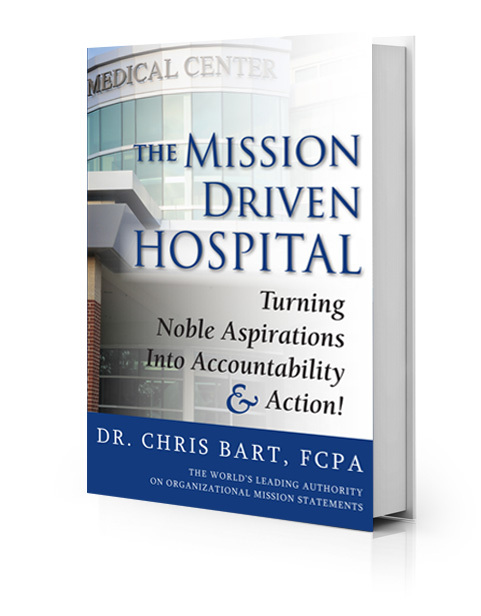 With 90% of mission statements failing due to poor implementation, The Mission Driven Hospital reveals the secrets that Dr. Chris Bart has discovered to help hospital leaders finally take the framed mission statement off their office walls and drive it to the front line. The book is filled with practical takeaway advice to turn any hospital’s mission statement from fiction into reality!